Online registration closes on July 26 but there is no penalty to register for the conference onsite. Registration opens at 4 p.m. PT Friday, July 29 at the Sheraton San Diego Hotel & Marina. Details online here. 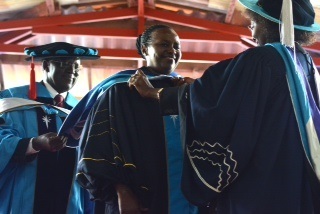 Prof. Mary Murimi on June 23 was officially installed as the third Chancellor of Daystar University in a ceremony held in Athi River campus. Increasing rates of overweight and obesity are affecting many countries and measures at all levels are urgently required. Today we are launching a new online discussion which invites you to share your thoughts and experience on this topic, and specifically on the following question: Are there any successful policies and programs to fight overweight and obesity?